Enter Arches NP from Highway 191 north of Moab. Follow the road and signage to the turnout near the posted coordinates. It is a short hike on a well marked path up a gentle grade to the base of the feature. 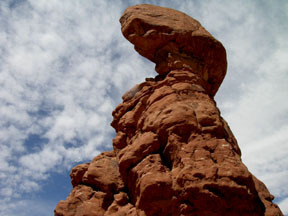 To be able to identify the Navajo and Entrada Formations within Arches NP. To be able to describe “ice wedging” as an erosional process. Supplies: Water, camera. Access to a computer and Google. Educational Requirement: To get credit for this EarthCache you must email us your answer to any one of the Study Questions and let us know how many people were in your party. College-Bound AP As you travel through the Park try to identify rock formations that might someday become balanced rocks. Post a picture of such a formation, along with its lat-lon coordinates. College-Bound AP What differences do you see between the Navajo and the Entrada formations? Freshman What differences do you see between the Slick Rock and Dewey Bridge members of the Entrada Formation? Freshman What is the difference between mechanical weathering and chemical weathering? What is “ice wedging”? Which processes are operating here? Ph.D. How would carbonic acid accelerate the erosion of sandstone? See Link Hint: What “cements” the grains of sand?